With policy regimes becoming increasingly open and, thus, similar, governments are making extra efforts to attract FDI (see table 2 and figure 4)and to strengthen linkages between foreign affiliates and domestic enterprises, with a view towards enhancing their countries’ economic performance. … governments are fine-tuning their policies to attract performance-enhancing FDI. Targeted promotion is important to attract capital, … Governments which actively seek investment also actively seek to improve their countries’ image within the investment community as a favourable location for investment. In doing so, they rely heavily on direct contact with prospective investors, especially important ones. In fact, successfully enticing one important TNC to locate in a country can trigger a chain reaction that leads to substantial sequential and associated investment. Examples abound. During the early 1970s, for example, Malaysia’s Industrial Development Authority (MIDA) identified specific companies in the then fast-growing semiconductor sector in the United States; these companies were targeted for discussions between senior government officials and executives of the companies. By 1987, Malaysia was the world’s largest exporter and the world’s largest producer of semiconductors. Selecting target firms involves a number of choices: which countries are likely sources, which industries are good candidates and, within those industries, which kinds of firms and activities should be sought. Therefore, successfully targeted investment promotion requires extensive research to determine which firms are likely candidates — not only to invest in the country but also what kind of investment they would bring. … and after-investment services are crucial for upgrading or retaining it. The most obvious targets are firms already established in a country. Governments can strive to encourage sequential investment (including through reinvested earnings), which can also provide positive demonstration effects for potential new investors: a satisfied foreign investor is the best commercial ambassador a country can have. Policy makers should be concerned when foreign investors leave the host country due to deteriorating local conditions. Emphasis on afterinvestment and investment-facilitation services for current investors is therefore crucial. This could involve the creation of joint committees consisting of representatives of government, foreign affiliates and local employees to try to resolve problems that could lead to relocation; avoid conflicts; and consider alternative solutions. Also, a business ombudsperson could be appointed to handle complaints about unreasonable delays and demands by government officials on business people. He or she could be given authority to report publicly and periodically on the business climate. The importance of FDI as a conduit for technology transfer has long been recognized by policy makers. However, today, policies in most countries focus on effective technology transfer, rather than regulating specific aspects of technology transactions. Consequently, a number of countries have not only liberalized their technology-transfer legislation relating to restrictions on contractual aspects, they have also focused more on improving the capacity to absorb and use new technologies. However, the actual policy instruments used in that regard can vary widely. Much depends on the existing and evolving levels of local skills and capabilities, and on the nature of the technologies concerned. What is desirable for a country such as the Republic of Korea may be inappropriate for Mexico and simply out of the question for a least developed country. Bearing that in mind, there are, however, two major types of policy instruments that can be said to facilitate technology diffusion. The first type embraces policy instruments that create an overall attractive environment for technology transfer. They support the institutional base conducive to building local technical skills; a general economic atmosphere that rewards enterprises and innovation; and a dependable legal system, especially intellectual property protection. The second set of policy instruments involves the promotion of linkages between foreign affiliates and local firms, as well as laboratories and research centres. Among the most common factors are workforce mobility; subcontracting and other backward linkages; equipment-supplier systems; user-producer relationships; consultancy services; informal linkages; and strategic alliances that may involve linkages with government, universities, local firms and research-and-development institutions. … with science parks playing an important role. Of special interest to governments wishing to attract technology intensive FDI is the establishment of infrastructural facilities to foster technology partnerships and encourage positive agglomeration effects. Science parks play a particular role in this respect. The current usage of these facilities, the extent of awareness of their existence on the part of TNCs, the identification of obstacles to their greater use, and the effectiveness of the available services and facilities are all aspects that need to be carefully assessed. Policies must, however, be consistent with a country’s mix of competitive industries, its stage of development, and the capacity of its firms and research institutions. Since not all countries have the resources necessary to develop science parks, regional or subregional initiatives may be useful to pool scarce scientific, technological, financial and institutional resources in specific sectors. It is indispensable for improved national economic performance that human resources adapt to technical change and contribute to diffusing technology. This requires appropriate training. Lifelong education and retraining are also important, supported by policies that link the educational system to industry and encourage industry’s own efforts at training. For that to be effective, however, requires policies that encourage a nexus between pre-work education and on-the-job training. Among other things, this could involve institutional support to promote cooperative arrangements between TNCs and local learning institutions. Such programmes may require fiscal incentives or other public support, but it is also important that TNCs be encouraged to contribute to the development of human skills beyond their standard operating procedures. If fiscal incentives or public subsidies are to be granted, they should be differentiated on the basis of the expected benefits of training. … but facilitating linkages is necessary for a further dissemination of skills. Education and training are, however, only part of the story. One of the most important determinants of a foreign affiliate’s impact on the technology and skills in a host country is the extent of its forward and backward linkages with local firms. More technology and skills will be transferred by FDI in linkage-intensive industries than by FDI in industries where such linkages are more difficult to develop. Thus, one policy approach is to encourage industries that lend themselves to local subcontracting through the purchase of parts and components from outside suppliers. Specific consideration might be given to the establishment of an “open school” for small and medium-size businesses, with seminars in various cities, lectures by TNC specialists, case illustrations, plant visits etc. Moreover, encouragement could be given to the establishment of centres that provide information and advice on matters such as the availability of courses, teaching materials and training techniques. Since lack of training is usually not the only impediment to a small firm’s competitiveness, these centres might offer complementary services such as technological information, market studies, management techniques, and industrial extension services in general, in order to increase their attractiveness to the business world. Incentives can also be offered to TNCs that have their own training centres to share their facilities and expertise with small and medium-sized enterprises, particularly suppliers and subcontractors. This would give smaller enterprises access to training and make use of subcontracting networks as collective education mechanisms. It could also be useful to co-finance visits to “best practice” plants abroad by representatives of small and medium-sized enterprises. Many countries have adopted export-oriented strategies to promote their development. In pursuing such strategies, governments, typically, focus on trade and exchange-rate policies, but tend to neglect the FDI dimension (see box 4). Few explicitly recognize that inward and outward FDI can be an important means of accessing world markets. Yet, market expansion can be one of the most important contributions that FDI can make towards the performance of host economies, especially developing ones, since foreign affiliates provide privileged access to the large markets within TNC systems and advantageous access to other markets due to linkages with TNCs. The implication for policy makers is straightforward: integrated investment and trade policies can facilitate access to international markets. Foreign-direct-investment policy should therefore have a trade component as TNCs are interested in whether a country is suitable for inclusion in their intra-firm division of labour; at the same time, trade policy should have an FDI component, precisely to take advantage of the market access that TNC systems provide. However, while many countries have liberalized their trade and investment policies, the two processes have tended to proceed at a different pace. When FDI policy is more open than trade policy, the type of investment that is attracted tends to take the form of stand-alone production units geared to the domestic market and often relies on trade protection. Such affiliates have difficulties in benefiting from the resources of their TNC systems, and can also be less subject to the rigours of competition. Generally, FDI should not be encouraged to be either entirely import substituting (e.g., through tariff incentives) or completely export-oriented (e.g., through export-processing zones). Both introduce inefficiencies and distortions. By contrast, as the recent Latin American experience shows, exposure to international markets is a powerful incentive for managers to cut waste, ensure quality control and upgrade production processes to world standards. And, as the contrasting experiences of export-processing zones and industrial estates also suggests, access to the domestic market stimulates the development of differentiated products and technological capabilities, which are less developed in specialized export units. … and support for the establishment of local linkages. The market access afforded by TNC systems need not be confined to their member firms. A key policy requirement for the successful establishment of linkages is the availability of local support services to potential small and medium-sized domestic subcontractors. Supportive macroeconomic policies are also important, particularly a stable exchange rate that is favourable to the production of tradeables, thereby encouraging local sourcing for TNC systems. Overall, the various FDI components should be treated as parts of a single package. For analytical purposes, policies regarding the different components of the FDI package can be considered separately. Since FDI is a package, it should be treated as such. The composition of the package that can be attracted very much depends on a country’s characteristics, including its level of development. This suggests that each government needs to determine what the role of FDI is in its economy and what the potential is for further FDI; to what extent the regulatory framework in place for FDI facilitates the realization of this potential; and what improvements (perhaps supported, where appropriate, by a technical cooperation programme) are needed to make the regulatory framework more effective. UNCTAD has initiated a series of Investment Policy Reviews, to assist individual governments with these objectives in mind. At the same time, UNCTAD will assist the members of the newly established World Association of InvestmentPromotion Agencies (WAIPA) to benefit from each others’ considerable experience in this area. International competition for FDI has led more and more governments to offer increasingly generous incentives to influence the locational decisions of TNCs (see figure 5). Incentives may be justified to cover the “wedge” between the social and private rates of return for specific FDI undertakings with positive spillovers and to reduce market distortions; they can thus serve a number of development purposes. However, they also involve economic, financial and administrative costs. 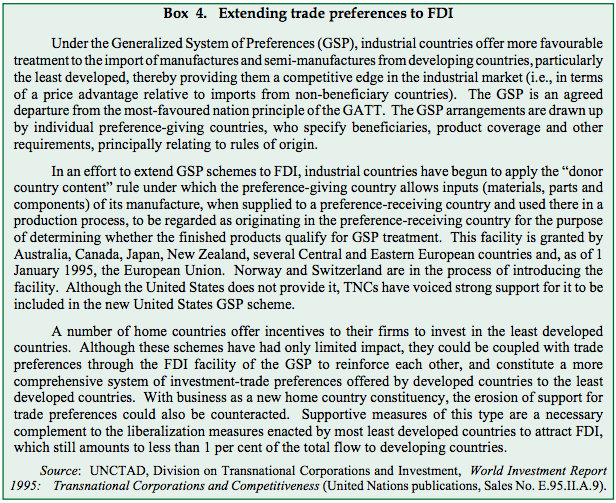 Moreover, as governments compete for FDI, they may be tempted to offer more and larger incentives than is justified. Competing for FDI with incentives can thus lead to welfare costs exceeding the benefits an investment can bring. … and, as a result, unavoidably and increasingly compete among themselves, which can lead to waste or distortions. Evidence suggests that the number and range of incentive programmes available to foreign investors has increased over the past ten years. For major investment projects, furthermore, incentives are often provided on an ad hoc basis, determined in negotiations with the investor. And as countries are orienting their development strategies towards exports, technology-intensive industries and higher value-added activities, incentives competition is especially strong in these areas. In fact, countries are deliberately changing their FDI-incentives programmes in the light of actions taken by other countries. Incentives play, however, only a relatively minor role in the locational decisions of TNCs (relative to much more important factors such as market size and growth, production costs, skill levels, infrastructure, political and economic stability and the nature of the FDI regulatory regime). This is not surprising since investment decisions are typically made because they promise to be profitable on the basis of market conditions alone; if incentives are offered, they typically become “icing on the cake”. Still, the impact of incentives is not always negligible. When all other factors are equal, incentives can tilt the balance in investors’ locational choices. But this logic fails when all countries do the same. National and international approaches are needed to contain excessive incentive competition. National initiatives. 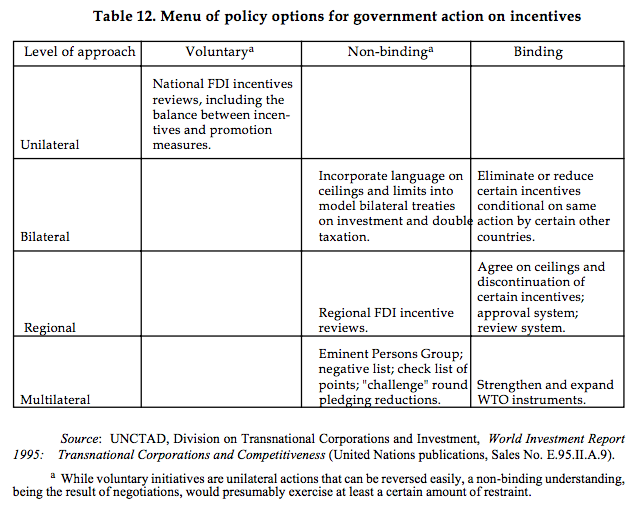 To rationalize the use of incentives, governments could undertake national incentive reviews to determine, among other things, the complete array of FDI incentive instruments — including discretionary incentives — at all levels of government; whether any of these incentives are redundant; what have been the results obtained from the use of incentives and at what cost for the country; whether some incentives can be eliminated, or a ceiling placed on them; and whether a proper balance is being maintained between investment incentives and undertaking investment-promotion activities. The Investment Policy Reviews mentioned earlier are also meant to include an inventory of FDI incentives, with a view towards helping governments formulate more effective and efficient incentive policies. A more detailed and systematic review of incentives could be carried out on the basis of a manual prepared for use by governments. Bilateral initiatives. Some countries have used bilateral investment treaties to curtail the use of performance requirements in host countries; a reduction of these requirements could also moderate the use of incentives that are linked to them. Moreover, in the absence of a multilateral or regional approach, governments could consider investment incentives when negotiating bilateral treaties on investment or double taxation, so that the issue would at least be tabled for discussion. In fact, it might be possible to negotiate a conditional incentives-limitation clause in bilateral agreements that would only become operative if a specified number of countries adopted the same clause. Regional initiatives. On the basis of incentive reviews similar to those that could be undertaken at the national level, efforts at the regional level to curtail excessive incentives could involve, among other things, agreeing on overall ceilings on investment-incentive packages; criteria to phase out some of the most distorting incentives; and prior approval of incentives packages by the competent regional organization. Multilateral initiatives. Multilateral efforts to limit incentives competition are in their infancy and could be reinforced and expanded. To assist this process, an International Group of Eminent Persons could hold hearings on FDI incentives, with the participation of the private sector as well as national and international institutions. Based on experiences with the effectiveness of incentives, the Group could explore a wide range of issues, including ways and means of (a) improving transparency regarding FDI incentives; (b) further clarifying and documenting the cost and benefits of FDI incentives; and, on that basis, (c) identifying a limited number of particularly distorting incentives, with a view towards dealing with them first; (d) elaborating a check list of points that governments should take into account in their incentives policies. The Group could conclude its work with a “challenge” round of pledges by countries to reduce the level of incentives by some fixed amount over a time period. A demonstration that such a pledge might be feasible could enhance the willingness of governments to seek a multilateral agreement on FDI incentives. Indeed, just as the international community has begun to deal successfully with subsidies that distort trade, it may be possible, step by step, to make similar progress towards dealing with incentives that shift the benefits of incentives from host country taxpayers to investing firms. In an increasingly integrated world economy, governments also need to pay attention to outward FDI. Historically, outward FDI was mostly undertaken by large firms from a small number of developed countries. More firms are however now establishing themselves abroad, including firms from developing countries and a growing number of small and medium-sized enterprises. For many firms, outward FDI has become a strategic option necessary to gain access to markets and resources. More governments recognize that outward FDI is a strategic option that should be left open to firms, lest they risk to impair the competitiveness of firms located on their territory — in fact, precisely the competitiveness of their strongest firms, namely those that have developed the ownership advantages that would allow them to establish themselves successfully abroad. Governments, too, have recognized that outward FDI can be to their countries’ benefit, precisely because of better access to resources and expanded markets and in their interest in economic restructuring and growth. Consequently, a process of liberalization of outward FDI regulations is taking place, although change in this respect has been distinctly uneven between developed and developing countries. Developed countries have historically permitted and even promoted outward FDI. Where capital flows were restricted, countries used foreign exchange or capital-movement control systems with accompanying licensing or project-approval requirements. The usefulness and effectiveness of national exchange controls was undermined during the 1980s. At the same time, changes in exchange-rate policies — notably the adoption of floating exchange rates — and improved monetary management techniques reduced potential problems that could arise from the lifting of capital-control restrictions. 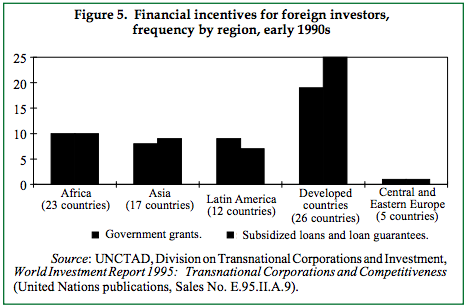 By the end of 1994, only three developed countries maintained (limited) restrictions on outward FDI. Information and technical assistance, which are provided by government agencies in virtually all developed countries to outward investors. At a minimum, these services include basic information on macroeconomic and business-cost factors, as well as the legal framework and administrative processes relevant to potential foreign investors in host countries. This type of service can be particularly important and cost-effective for smaller prospective investors. Direct financial support. Financial support was provided in about half of the developed countries during the 1980s, through development-finance institutions. For example, at least eight Japanese agencies sponsor programmes that promote outward FDI, the Export-Import Bank of Japan standing out as a unique institution in this respect. Similarly, the German Investment and Development Company, the United Kingdom’s Commonwealth Development Corporation, the European Community’s Investment Partners Programme and, on a broader scale, the International Finance Corporation provide both loan and equity financing for FDI projects in developing countries. Other countries’ programmes emphasize the link between FDI and exports (e.g., the Canadian Export Development Corporation). Investment insurance. National investment insurance programmes exist in most developed countries — and at the international level — to provide coverage for expropriation, war and repatriation risks. In the United States, for example, the Overseas Private Investment Corporation has provided financing and political risk insurance since 1971 to support United States investments (worth some $73 billion) in 140 countries worldwide, generating an estimated $40 billion in exports and supporting more than 100,000 jobs in the United States. For many firms, the availability of such insurance is important when contemplating investment in developing countries. With domestic outward FDI policies liberalized, developed countries have sought to supplement their domestic policies with international instruments aimed at protecting and facilitating outward FDI by improving FDI liberalization standards generally and levelling the playing field among themselves. An expanding network of bilateral, regional and international agreements has been the result, which, eventually, may give rise to a comprehensive multilateral agreement. Few developing countries and economies in transition have paid much attention to outward FDI policies; typically these are subsumed under general capital-control policies which, in turn, are normally quite restrictive. The reasons appear self-evident:developing countries typically face a foreign exchange shortage and are capital constrained. In recent years, however, these concerns have been re-evaluated. Governments are seeing merit in their firms and economies having better access to markets and resources (both material and labour inputs) and benefiting from restructuring — or, broader, in becoming part of the emerging international production system. Among the Asian economies, the Republic of Korea and Taiwan Province of China already have a long record of liberalizing and in the case of the latter, even encouraging outward FDI. In the case of the Republic of Korea, “globalization” is the watchword of international economic policy-making, and outward FDI is an integral element of it. Singapore’s history of liberal trade and investment policies has made it one of the first developing countries to pursue a deliberate policy to acquire, through outward FDI, an “external wing”; the country now emphasizes the need to seek overseas investment opportunities and actively supports outward FDI. Malaysia and Thailand, too, seek to ensure the competitiveness of their firms not only by allowing but actively promoting outward FDI, especially in a regional context. India, after allowing outward FDI in the form of equipment and technology exports, has just begun to liberalize outward FDI to help improve international trade competitiveness, substantially relaxing requirements for prior approval. China, since the early 1990s, has embarked on a course to create “world class transnational corporations”, as part of a broader quest for deeper integration into the world economy; the country’s priorities revolve around securing access to markets and to key natural resources, and acquiring new technology and management skills. Despite retaining constraints on capital exports, China recently became the leading source of FDI from the developing countries, investing in both developed and other developing countries. In Latin America, Chile is perhaps most advanced among the principal outward investors in terms of liberalizing outward FDI, rivalled only by Mexico; there are no ceilings on the amount of capital allowed for outward FDI projects, nor are there any restrictions with respect to the financing of such investments. Balance-of-payments considerations constrain but do not prevent outward FDI from Central and Eastern Europe, with most countries of that region maintaining various forms of restrictions on outward FDI. Most restructured or privatized state enterprises have sought to retain their existing foreign affiliates, while reform programmes spurred a mini-surge in outward FDI in the early 1990s. Many of these countries also have incipient promotional policies. Specific programme goals and contents vary widely. Fiscal incentives generally play an important role in supporting outward FDI. Various types of direct financial support and incentives are provided by India, the Republic of Korea, Malaysia, Singapore and Taiwan Province of China. While Thailand does not provide fiscal incentives, the Export-Import Bank of Thailand provides enterprises in Thailand with access to a number of facilities such as long-term loans at preferential rates and equity participation in certain projects. Investment insurance programmes have so far not been priority concerns for these countries. In any event, the need to provide such insurance has been alleviated by the establishment of the Multilateral Investment Guarantee Agency in 1985, which provides insurance for noncommercial risks for firms from member countries undertaking outward FDI. The emergence of a number of these countries as home countries is also leading to a change of attitude towards international agreements on FDI. 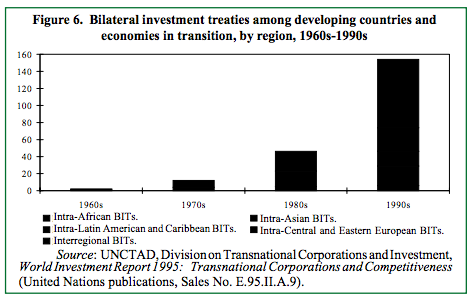 This is most obviously reflected in the growth of bilateral investment protection and promotion treaties signed among developing countries and economies in transition: only two such treaties were negotiated in the 1960s, followed by 12 in the 1970s, 46 in the 1980s, and 154 in the first half of the 1990s (figure 6). … suggests several approaches — but no single model — for selecting and implementing more liberal outward FDI policies. Once a country has decided to liberalize its outward FDI regime, one option is to do this all at one stroke. More typically, the issue is how to phase in a liberalization programme involving the design of a mechanism to approve desired outward FDI. An approval process enables governments to control directly the purposes, nature and dimensions of outward FDI projects while reducing general restrictions. At the same time, however, such an approach substitutes government decision-making for market signals in determining business responses to global competition, with all the known risks. A minimal procedure, contemplated for example in Hungary’s draft foreign exchange law, only examines whether applicants are in good standing in respect to their domestic financial obligations. A related criterion tests the financial soundness of the prospective outward investor, requiring at least a minimum period without bankruptcy or, more positively, a certain level of profitability over a number of years as a measure of managerial ability and the probable success of the new venture. Another approach is to organize the approval or licensing process on the basis of the size of the prospective investment: full assessment would be required only for projects over a certain size. A third approach is to evaluate all proposed outward FDI projects against a list of benefits desired for the home country (e.g., increased exports, inward technology transfers, raw material imports, repatriating earnings). An industry approach is more common when the opposite “negative list” approach is chosen, requiring review and permission only for specified industries. Still another approach is to review and approve outward FDI applications in terms of country or regional destinations or in the light of the existence of bilateral investment or taxation treaties. Broader foreign policy considerations may also influence outward FDI approvals, positively or negatively. Each of these options, individually or in combination with each other, permits countries with restrictive regulations on outward FDI to liberalize their regimes incrementally, if they so desire. Outward FDI can be financed by foreign borrowing. This is, in fact, not an uncommon practice (though not recorded in FDI-flow statistics). In the case of a merger or acquisition, the foreign borrowing can be secured by the assets acquired, with the servicing and repayment of the debt being made from profits arising from the new venture. For greenfield enterprises, a guarantee could be issued by the parent firm in the home country, to be replaced by the pledging of the assets once these have been established abroad; unless executed, this guarantee would not appear in the balance of payments of the home country. However, these guarantees would be taken into account when determining the credit available to the country from abroad for other purposes. Alternatively, the government of the home country could provide a guarantee for the loan required, once an outward greenfield FDI project is approved and a foreign bank has agreed to finance it. In a variation of this approach, host country financial institutions could issue a bridge guarantee to be replaced by the assets of the foreign affiliate once it is established. Foreign-direct-investment venture capital funds could be established by investors looking for good projects abroad. Such funds, in turn, could provide finance to FDI projects, including approved FDI projects by firms from countries that restrict capital outflows on account of foreign exchange difficulties. In a variation of this technique, such entities as insurance companies and pension funds could be allowed to diversify their investments. Initial permission for such investments could be linked to the funding of approved outward FDI projects from the same country, thereby utilizing the same foreign exchange draw-off for a dual purpose. In cases where foreign affiliates already exist, a government could permit the liberal usage of the earnings of these affiliates for (additional) investment abroad, be it for the expansion of an existing venture, or the establishment of a new venture. Such reinvested earnings involve, for balance-of-payments account purposes, simultaneous (offsetting) entries in both the current and capital accounts, i.e., they do not affect the level of foreign reserves. In those cases in which outward FDI involves the establishment of sourcing or marketing affiliates in countries that are less developed than the home country, it is possible that the central bank of the home country has assets denominated in the (non-convertible) currency of the potential host country, thus making it easier to authorize outward FDI. Some or all of the assets for outward FDI can consist of such intangible assets as intellectual property rights, goodwill or brand names, or such tangible assets as capital equipment or raw materials. Some of these approaches may be particularly suitable for joint ventures. The use of non-equity forms of FDI. Management contracts, licensing arrangements, franchising and the like provide, for parent firms, many of the advantages of reaching foreign markets and factors of production, without involving any foreign exchange outlays. Experience suggests that the availability of substantial foreign exchange reserves facilitates the liberalization of outward FDI policies. But it suggests also that balance-of-payments concerns do not preclude liberalization. Still, there is no denying that countries facing foreign exchange constraints confront a policy dilemma concerning outward FDI policies. The allocation of scarce exchange reserves requires trade-offs among competing objectives (financing imports, servicing debt, servicing of inward FDI, financing outward FDI, etc.). Nevertheless, most countries should be able to develop calibrated and phased liberalization strategies that fit their own conditions and permit enterprises to maintain their international competitiveness through outward FDI. Going beyond liberalization, careful thought is required before countries — be they developed or developing — choose promotional measures to accompany their regulatory reforms. The promotion options cover a broad range of measures whose costs and potential distorting impacts increase as governments move from providing information services to offering fiscal and financial incentives. Providing basic information on possible FDI locations is a relatively low-cost promotional technique useful at early stages in outward FDI and of particular interest to small and medium-sized investors. Fiscal or financial incentives involve a subsidization of enterprise operations and is harder to justify on both economic and political grounds. Government-sponsored insurance programmes and bilateral investment protection and promotion treaties can be effective and are less costly. In conclusion, as countries become more closely integrated in a globalizing economy, the competitiveness of national firms in foreign markets will become increasingly important to overall national performance. The dilemma for national policy makers is that of balancing macroeconomic balance-of-payments considerations with the microeconomic competitiveness requirements of individual firms. In considering this policy dilemma, governments must recognize that firms which are restricted to invest abroad in today’s world economy are being handicapped. Furthermore, if imports and inward FDI are being liberalized, they are doubly handicapped, in that firms must confront foreign competitors at home without a comparable opportunity to realize the benefits from their own overseas investments or from challenging competitors in their home markets. When liberalizing outward FDI, governments can turn this double handicap for their firms into a double advantage for their countries: they can benefit from allowing their own firms to exploit their ownership advantages (and thereby improve competitiveness) by operating in foreign markets; and they can benefit from allowing foreign affiliates in their countries to develop overseas projects. In fact, if governments are not sufficiently flexible in terms of allowing outward FDI, they may actually face the loss of firms, including perhaps of those which could have become competitive internationally. This can occur when the handicapped firms cannot withstand the increased competition in their own markets and, therefore, fail — or relocate their headquarters to another country. Be that as it may, each government needs to decide on its own, in the light of its concrete circumstances, the precise modalities of liberalizing its outward FDI regime. Towards a multilateral agreement on FDI? Inward and outward FDI policies were considered separately in the preceding analysis and, typically, are considered separately by governments. In reality, however, they interact, being joined, in particular, by the overriding desire of all countries to improve their economic performance and restructure their economies towards higher income-creating activities, and the contribution that FDI can make in this regard. As more countries become more important both as home and host countries, the interrelationships between inward and outward FDI will become more apparent as well, as will be the interests of countries in stable, predictable and transparent international investment relations. In fact, given the growing importance of FDI and international production for linking national economies and improving national economic performance, and given the transnational nature of this investment, it is almost unavoidable that a framework will be sought that provides for stability, predictability and transparency at the multilateral level, to allow firms to contribute to economic growth, while prospering internationally. Elements of a multilateral framework — and the seeds for something more comprehensive — are contained in the Final Act of the Uruguay Round of Multilateral Trade Negotiations, now being implemented by the World Trade Organization. Efforts could furthermore build on achievements at the regional level, in the context of trade-related regimes, especially in the framework of the European Union, NAFTA, MERCOSUR and APEC. Progress is also being sought among the members of OECD which, in September 1995, began negotiations on a binding Multilateral Agreement on Investment; the Agreement, once concluded, would be open to non-members as well. UNCTAD, for its part, is helping in the discussions on an international framework for FDI through activities designed to advance understanding of the issues involved, especially as far as the development discussion is concerned, and to promote consensus building. Whether or not these efforts will lead in the foreseeable future to a comprehensive and effective multilateral framework facilitating international production, giving due regard to the various forms of accessing markets for goods and services as well as for factors of production, cannot be predicted at this time. What can be said, however, is that, if such a framework were to be established, it could well rival in importance the international trade framework created by GATT some 50 years ago in terms of setting new parameters within which TNCs maintain or increase their competitiveness and countries improve their economic performance. As the trend towards liberalization and facilitation of inward FDI continues, ... ... governments are fine-tuning their policies to attract performance-enhancing FDI. ... and after-investment services are crucial for upgrading or retaining it. Transfer of technology remains an important issue for most countries, but facilitating the diffusion of research-and-development capabilities is increasingly becoming as important for many, ... ... with science parks playing an important role. Encouraging the acquisition of skills through training is fundamental, ... ... but facilitating linkages is necessary for a further dissemination of skills. Foreign direct investment can facilitate access to world markets ... ... but this requires policy coherence ... ... and support for the establishment of local linkages. Overall, the various FDI components should be treated as parts of a single package. Governments use incentives to attract and retain FDI ... ... and, as a result, unavoidably and increasingly compete among themselves, which can lead to waste or distortions. National and international approaches are needed to contain excessive incentive competition. In an increasingly integrated world economy, governments also need to pay attention to outward FDI. The experience of developed countries ... ... and of developing countries and economies in transition ... ... suggests several approaches -- but no single model -- for selecting and implementing more liberal outward FDI policies. Towards a multilateral agreement on FDI?